The last time I really thought about the fashion world was in September 2001. When the planes hit on the morning of the 11th, the city was replete with fashion journalists, who had all converged in New York to cover New York Fashion Week. As events unfolded, fashion correspondents became the reporters on the ground, way out of their comfort zones, and what resulted were strikingly human reports, devoid of accepted newspeak. I think that’s why I generally avoid reading about fashion. I presume it’s a world devoid of real humanity, interchangeable clothes horses paraded around exclusive paddocks, sporting nothing that the average person could or would ever wear. I realise it’s a vaguely ignorant viewpoint, but it’s one that kind of fuelled itself. 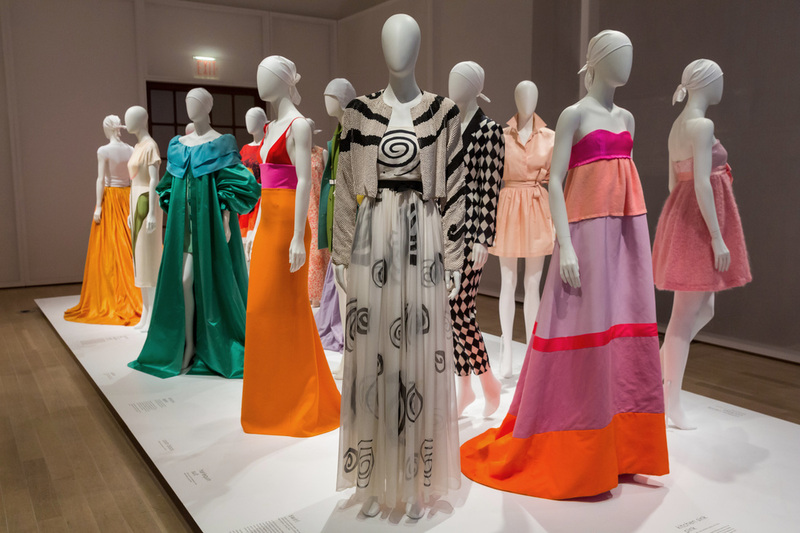 The Jewish Museum in New York City wasn’t the place I imagined I’d have humanity in fashion demonstrated to me, but exploring Isaac Mizrahi: An Unruly History, was like being sideswiped. Mizrahi’s back story helps: a pudgy Jewish kid with ridicule issues is fortunate enough to have the parents (with the generosity/resources) to escape his strict religious school to go to New York’s High School of Performing Arts and Parsons School of Design. By 26, Mizrahi is showing his own designs, rocketing into the NY fashion scene, acting in Woody Allen movies and starring in charismatically candid documentaries about the fashion world (1995’s Unzipped) – self-effacing and insecure enough to garner sympathy from the accessibility, something you suspect not many high-end designers could pull off. The exhibit begins with a huge wall of swatches, meticulously arranged and speaking to Mizrahi’s dedication and panoramic arsenal of influences. The first room is his broadside on fashion from early shows that would become his signature – a satirical, almost political mix of luxurious fabrics and ideas mixed with everyday, mundane items. “Baby Bjorn Ball Gown” (1998) is a red satin dress accessorized with a baby carrier. This juxtaposition would stay with his through to works such as “Elevator Pad Gown” (2005) a floor-length skirt that assembled from (fake, but still) pieces of gray and blue movers quilts. There’s a snook being cocked at convention and the line between fake and authentic, because what are those things, anyway? Some of the pieces might be obvious, one-line jokes, but I imagine that’s way more jokes than most designers ever tell. Added to his showpieces are otherworldly opera costumes and some incredibly engaging colour sketches. The clothing slowly hints at his evolution into his present day focus: making high-street looks for mass consumption. The t-shirts and leggings are already there in his couture repertoire; having dressed Naomi Campbell and Kate Moss, Mizrahi now looks to providing for the everywoman. The show ends with a video montage of Mizrahi’s career, with the glamour and the catwalks and the knowingly moody shots of him playing piano to his dog and the talk shows and the shopping channel segments. What comes across in all of them is the unabashed joy, and a true love of women. Mizrahi is like the kid who got the keys to the kingdom when life could have been so different. It takes work and talent to stay there, but I assume it takes even more to consistently retain the humour and the humanity, and that’s what An Unruly History celebrates.